So in this post we will talk a bit about power management and settings for your devices you connect inside or outside your computer, this could be network adapters, display adapters, smart card readers, audio devices etc.. Your property page may look completely different, but I try to use this example and provide a step by step guide how to change the settings. Wonder why these property pages are different? Simply because vendors use different technology in their devices and technology revolve and get better and better and more power efficient, if you have an old device chances are high you don’t get any vendor specific power management at all. 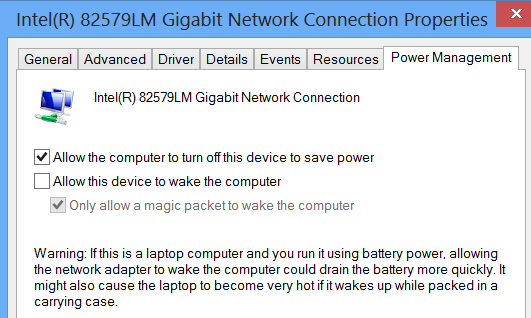 Lets start with the second option ”Allow this device to wake the computer”. What does this option actually mean? If you have a mouse or keyboard with this option you can simply tap or move it to wake up the computer. Ok, done! But now what about the first and third option that appears? Powercfg will not help us here, so I went to search thru MSDN and the WMI repository and found nothing interesting. I have to make a note for the WMI Class MSPower_DeviceWakeEnable, this one is not documented equals not supported, but it could work but I have seen users getting error message 0X80041010 when trying to use this, and that means Class not found. Double click this row and that will filter only the interesting part and right click and jump to.. and that will take you directly to the registry key. So monitor this key, until you get your settings right, for me a HEX value of 0 did the trick. Restart your computer and see if you changes are applied. Ok so the next time, do I really need to open Procmon? No, just keep in mind the registry base, HKEY_LOCAL_MACHINE\SYSTEM\CurrentControlSet\Control\Class\, open the Details pane of the device you want to edit and browse to Driver Key, there it is, the GUID and Device ID. $adapter = Get-WmiObject -Class Win32_NetworkAdapter -Namespace "root\cimv2" -Filter "deviceId='$DeviceID'"
$adapter = Get-WmiObject -Class Win32_NetworkAdapter -Namespace "root\cimv2" -Filter "name='$DeviceName'"
Write-Host "Writing $regName and $regvalue in $registryBase"
I think this is rather strange forward, just make sure to edit the script with your device id or device name and registry name and value and you are good to go. These settings are most probably located in the same place in registry, so just find the correct registry name and edit with your value in the script and you should be good to go. 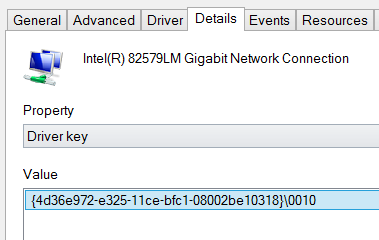 and one URL for power management for Network devices in Windows 7.